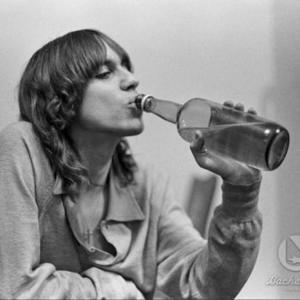 James Newell Osterberg, Jr (born 21st April 1947 in Muskegon, Michigan, United States), better known by his stage name Iggy Pop, is a rock singer and occasional actor. Pop is one of the most important innovators of punk rock. Also referred to as "the Godfather of Punk" and "the Rock Iguana", he is widely acknowledged as one of the most dynamic stage performers of rock. Pop was the lead singer of The Stooges, a late 1960s/early 1970s band that featured brothers Ron and Scott Asheton and Dave Alexander and was highly influential in the development of hard rock. Pop was the lead singer of The Stooges, a late 1960s/early 1970s band that featured brothers Ron and Scott Asheton and Dave Alexander and was highly influential in the development of hard rock. The debut album was produced by the Velvet Underground's John Cale. The band's "I Wanna Be Your Dog" is a garage punk standard. Raw Power was first released in1973, perhaps the first record that could truly be called punk. It was the confluence of The Stooges ages, hormones, creativity, ability, experience, tastes, lack of supervision, contempt for authority and ambition that has made Raw Power one of the most influential albums of all time. The Stooges were infamous for performances in which Pop leapt off the stage (hence, the "stage dive"), smeared raw meat or peanut butter over his chest and cut himself with broken bottles. A glimpse of the vibrating intensity of Iggy live can be seen in the Ramones movie "End of the Century." Guitarist James Williamson became a key collaborator, a partnership documented on the 1978 album Kill City. In 25 years as a solo artist, Pop's best-known songs have included the thumping Lust For Life, to be heard on the soundtrack of the find-a-vein, shoot-it-up movie Trainspotting, I'm Bored and The Passenger (the latter based on a poem written by Jim Morrison). David Bowie played a key role in reinvigorating Pop's post-Stooges career and was a collaborator on the albums Lust For Life and The Idiot. Iggy may be under-rated as a songwriter. Bowie and Tina Turner covered his "Tonight". Bowie also put out his own version of "China Girl," while Grace Jones covered the icey "Nightclubbing".